40,000 points Earn 40,000 points after you spend $1,000 on purchases in the first 3 months your account is open. Gaining Companion Pass eligibility. 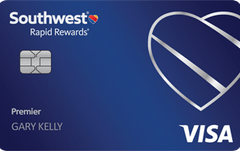 Southwest offers a one-time bonus of 40,000 points to cardholders who spend $1,000 on purchases in the first 3 months. Our take: With an above average rewards value and a top shelf sign-up bonus, the Southwest Airlines Rapid Rewards Premier card packs an impressive amount of earnings into its rewards program.